As an effective load support and water-resistant mechanism, roof sheathing has become an indispensable part of roof layers. 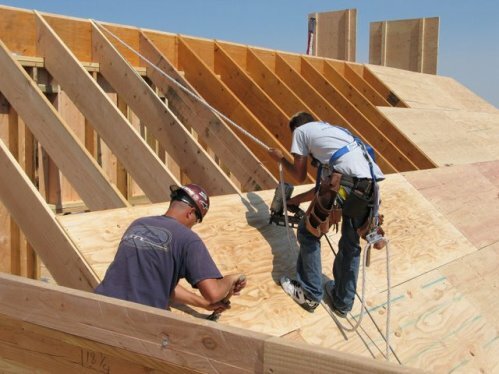 Roof sheathing materials include plywood, oriented strand board, lumber, hemlock, fir, redwood, or spruce. The sheathing layers protect your roof against sagging, leakage, and other forms of damage caused by water penetration and extreme weather elements. With the numerous benefits plywood delivers, it is still the most common choice for roof sheathing. ● It is durable and strong. Plywood remains to be the top sheathing material because of the durability and strength it possesses. It is the best choice for broader and stronger roof support that evenly disperses the weight or increases load tolerance. Its thickness can hold up heavy roof coverings and other equipment placed on the roof such as solar panels and air-conditioning units to prevent roof collapse. In addition, its stable and movement-resistant properties against swelling, shrinking, or warping protects your roof from leakage and failure. ● It has quick dry mechanism and excellent moisture resistance. As plywood gets wet due to inevitable exposure to weather elements like rain, ice and snow, it consistently swells but returns to its original dimension when it dries out. Its quick dry mechanism also reduces the risk of degrading the plywood’s quality as it is exposed to moisture for a longer period of time. This means that no ridges will be visible and your roof will not sag, rot or breakdown, which may cause severe leakage. ● It has good insulation property. Plywood has a good insulation property that gives extra thermal protection to your home. Plywood could reduce the heat brought about by hot weather conditions or the extreme warming of the roof due to overexposure to the sun’s heat. Through this effective cooling system, the thermal heat from the sun are being ward off. You don’t only get to enjoy reduced household electricity bills; you also get to contribute to environment protection. The good reputation and excellent performance of plywood help maintain the trust of construction companies and homeowners. Today, plywood continuously dominates the market due to its vital advantages as a perfect underlayment in the roof construction. Are you looking for the right roofing materials for sheath layers? Make sure to hire professional roofing services to help you properly install your roof sheathing and make the most of the plywood’s benefits in reinforcing your roof.